Finally! The sun is shining and spring things are happening. As our kids say, “Can we get a hoy ya?” With all of this spring-y goodness popping up, our crew decided to visit the 235-acre Cathance River Preserve in Topsham. The preserve is home to three main trails and four unique connector trails, making it easy to tailor a hike that works for your family. We started our hike at the .90 mile Highland Trail. Our adventure began with a pristine view of a vernal pool. There’s a small dock here, where the kids enjoyed posing for pictures and generally being silly. If you follow this blog, you might have noticed our posts have been sporadic for a long time. And while we’re not fond of relying on excuses, here’s a really good one: Mom Potato has spent the past two years working on a book with you, the Cute Potato reader in mind. 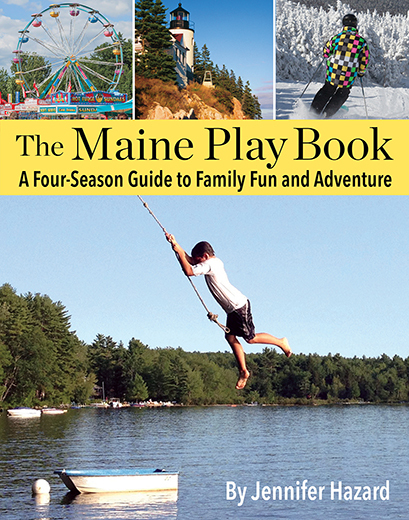 The book, which is titled “The Maine Play Book: A Four-Season Guide to Family Fun and Adventure” comes out at the end of May, and we couldn’t be more excited to share it with you! MP adores fall in Maine — the crisp mornings, the golden sunlight and the vibrant leaves make the season feel like a celebration. Winter is right around the corner, and for this reason, she feels compelled to spend as much time outdoors as possible. Our family had never traveled to the Rangeley area before, so we decided to make the most of an autumn weekend in this stunning part of the state.